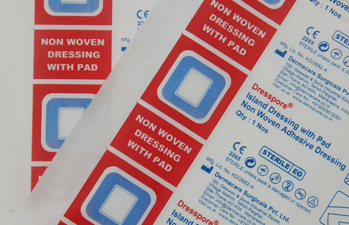 Ready-for-use DRESSPORE Nonwoven Island dressing for initial sterile wound care and for changing dressings on wounds of all types - In the operating theatre, outpatient department and doctor's surgery. This dressing with its extremely high absorbing capacity has a non adhesive cotton pad with a polyethylene net layer on the wound side; this allows discharge to diffuse into the absorptive part, accelerates wound cleansing, yet does not disturbed when the dressing is changed. 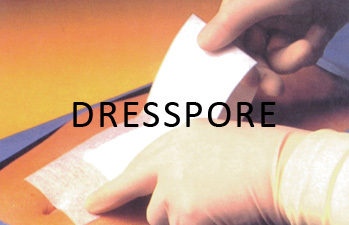 Reliable all-round closure provided by particularly adherent skin-friendly acrylic adhesive; the DRESSPORE wound dressing can be removed from the skin painlessly and without leaving any residue. Delicate, elastic nonwoven carrier material, white, 100% viscose rayon, with hypoallergic acrylic adhesive (free from colophonium and colophonium derivaties); dressing pad with an absorbent layer made from viscose rayon and a non adhesive cotton pad with a polyethylene net layer, individually sealed, sterlized by ETO. Non-woven backing, extensible, made of polyster fibres. High absorption capacity non-woven central pad, covered by a polyethylene non-adherent net. Adhesive on all 4 sides. Supplied under individual peelable sachets. Extensible : Follows the movements of the articulations or skin wrinkles without risking rupture or lift-off. Non-woven : Micro-aerated, no maceration. High skin tolerance : Respect of sensitive skins. Does not stick to the wound thanks to its polyethylene net covering the pad. Long lasting adhesiveness with easy removal, full protection of the wound. Sterile dressing reducing risks of contamination. 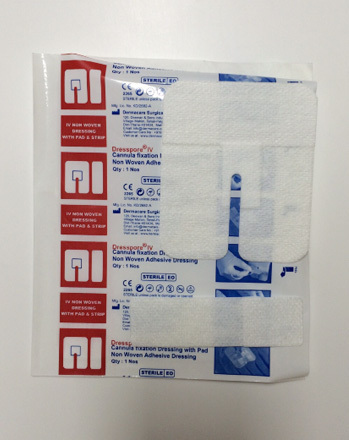 Sterile Adhesive Dressings are ideally suited for post-operative use. They are also useful in Accident & Emergency for cuts, laceration and sutured wounds. Fast efficient and aseptic protection of the puncture points : Parental feeding, biopsy, dialysis. Dressing for : Ambulatory surgery, post-surgery, coeliosurgery. We are offering our clients a broad range of IV Dressing that consist of micro porous non-woven fabric, medical hypo-allergenic adhesive and absorbent pad. These are mainly employed to fix vein bleeding and all kinds of cannulae and infusion lines. 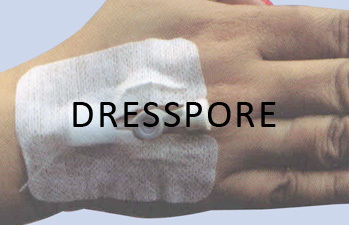 Additionally, it is made from high quality non-woven fabric with mesh these IV dressing and cannula fixation dressing making skin breathe properly and naturally, excretising water and air thus reducing the chances of infection. Made from soft and absorbent viscose rayon.